The trunk desk was inspired by the custom order of the famous British writer, Sir Arthur Conan Doyle, for Goyard, which was a trunk that could double as a writing desk. What came out of the workshop of luxury luggage purveyor, Edmond Goyard, was a trunk that features some storage space, a bookcase, and a writing surface or table. Today, the trunk desk of Sir Arthur Conan Doyle is reproduced while retaining its intricate details and impressive presence. It’s often made of wood or veneer with deeply stained finishes and handcrafted inlay patterns. Because a trunk desk is made to be a workstation where you, the user, spend most of the day working, it is important for the selection process to be given due consideration. Read on as we’ve listed the best trunk desks currently available and some tips on how to choose the best one. The first trunk desk on our list is based on a 1900s steamer trunk that actually traveled the world. 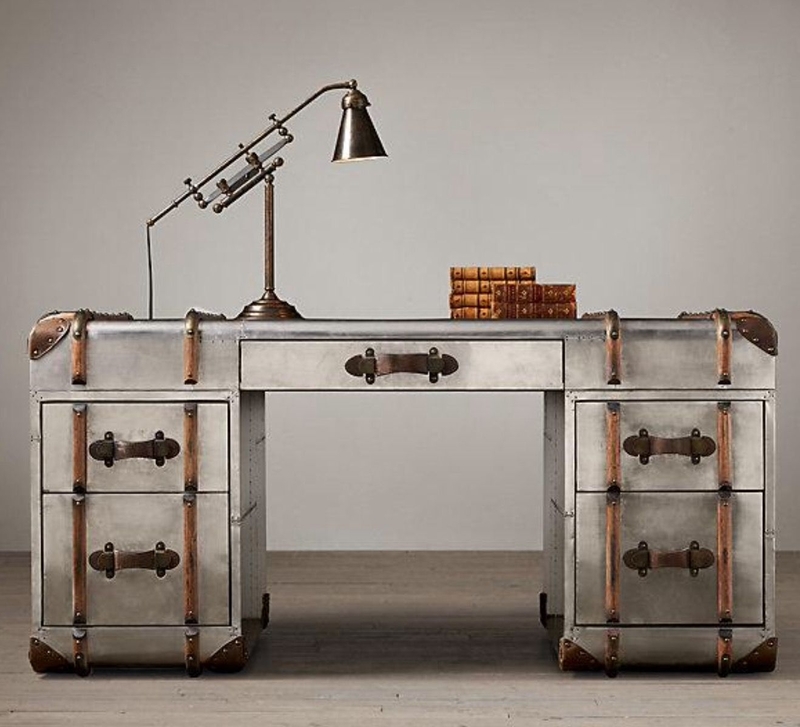 It is a remake that is built using the same techniques used with the trunk desk that Timothy Oulton made using the pins, hinges, and braces of the well-traveled 1900s trunk. As the wooden framework of the piece is clothed in polished aluminum then given accents using steel screws, there's no denying the fact that this trunk desk has managed to reinterpret the splendor of the years passed in a contemporary way. Consider this one of your best options as its charm is the touch you need in making your home unique. Elegant and luxurious, the second masterpiece on our list is still from Restoration Hardware. With its vintage cigar leather wrap that's added on all sides of the unit, it can easily be positioned in your living space. This 5-drawer trunk desk is built with a hand-crafted solid wood framework, giving you a piece that's unlike no other. Its overall dimensions are 63"W x 31½"D x 30"H, so it's in the best size. You won't find it hard to fit the unit into your space regardless of the room's size. The most notable aspect of this trunk desk is only the finest materials are used and transformed by utilizing handcraft mastery and top-notch methods. This is a furniture piece that you can pass down to several generations. A simpler reproduction of an antique steamer trunk, this unit boasts of a brushed steel construction with a handcrafted solid wood framework. The trim is made of leather with drawer pulls and corner brackets that are accented with thousands of hand-hammered brass nail heads. It has three storage compartments that are lined with canvas. What made us include this on our list of the best trunk desks is the fact that it lends style and functionality to workstations and living spaces. Measuring 48½"W x 20"D x 30"H, it has a great size, plus it's stunning, simple, and graceful - all the aspects that make the best desk. Mimicking an aircraft's riveted exterior accented with trunk parts, the Aviator Trunk Desk is a piece of furniture that you can bet to be unforgettable. The aluminum panels have been painstakingly shaped, then fixed using hand-applied nails. Its creation consisted of different stages to create the impression of being distressed and worn. Pay homage to some of the greatest planes ever built including trunks that roamed the world with this gem. With its considerable size of 64 x 32 x 31 inches, this could be the statement piece that will complete your space's look. If you just want a cheap alternative to trunk desks that are filled with history and romance behind them, then there's no better product than this Old Style Desk Podium Desk from Quickway Imports. From its name alone, you already know that it offers three functions: to serve as your desk for writing, a podium, and of course, a storage chest. Going for this product and adding it into your home can give you all kinds of exciting reactions. You'll be able to take visitors and guests to the past or another time period, without spending thousands of bucks. As a bonus, the Old Style Desk/Chest/Podium doesn't appear cheap at all. As a matter of fact, it looks like it actually came from a bygone era! The Ludlow Trunk Secretary Desk is sought-after among homeowners as it's such a great addition to living spaces, especially home offices. Trunk secretary desks, including this piece available on Pottery Barn, make smart use of space as they take a minimal amount of floor space but they offer a lot of room for storage and writing or working. Is that all? Of course, not! The Ludlow Trunk Secretary Desk is so versatile that it can also accommodate your office equipment like your laptop. The piece is finished by hand to give an antique appeal, then sealed using a protective lacquer, making the unit moisture-resistant. With its functionality and aesthetic appeal, you definitely get your money’s worth with this one. Now that you know what your best options are when it comes to trunk desks, let’s take a look at some aspects that require consideration to make the best selection from the 6 products featured. When buying a trunk desk, getting the dimensions of the available space in your home or office will make the selection process a lot easier. A good way to keep you focused on your choices is by ruling out the desks that are too large for your room. But, there are a couple of other measurements that you need to think about, so your space is enjoyable to use and efficiently organized like the windows, access, doors, and a lot more. Windows - You would want to place your trunk desk where there’s limited sun glare as you work. Also, a trunk desk is best preserved and direct sun exposure won’t do its finish or construction materials any good. Access - Consider how the desk will reach its placement inside your home or building. Will it have to go up a set of stairs? Maybe you’d have to bring it across a narrow hallway or fit a small door. If you can bring your chosen desk inside your room without any problems, then you can definitely get the piece. Door - Leave ample space so the door of your room can fully open even when a trunk desk is added. Room for Movement - Leave at least 4 feet of space behind your desk so you can sit down comfortably or pull out a chair. Position of the Monitor - If you will be mounting a monitor on the trunk desk, it should be 20 to 30 inches from the user’s face. As for the top of the monitor, it should be level with the user of the desk’s eye height. Leg Clearance - Most trunk desks are 30 inches from the floor, and they are designed to work well for people that are 5'6" to 5'11" tall. A general guideline to follow is to choose the height (for the desk) that feels comfortable. The user’s hands must rest flat on a surface with elbows down or bent at an angle of 90 degrees. Work Surface - Important items that you need frequently for work like pen cups and filing trays must be within reach. Desk Chair - A trunk desk requires to be paired with a desk chair unlike standing desks. For you or the user’s maximum comfort, get the chair that has armrests for elbow support. Good lumbar support will also keep the user’s back feeling great even after sitting for hours. Chairs with rollers provide greater maneuverability. Different materials influence a trunk desk’s appearance and express a certain style. For example, metal gives a more modern vibe and dark woods give off a timeless look. If you want the traditional material to suit your classic style room, wood is your best option. It may be painted for a clean finish or stained to feature the material’s natural grain pattern. A trunk desk that consists of laminate is a more practical option. It has the same colors as genuine wood, so you can easily mistake it for solid wood. Although metal like polished aluminum has a more modern vibe to it, it doesn’t take away the authentic look of trunk desks. Metal is also durable, so your desk will last for years without requiring the maintenance that wood needs.